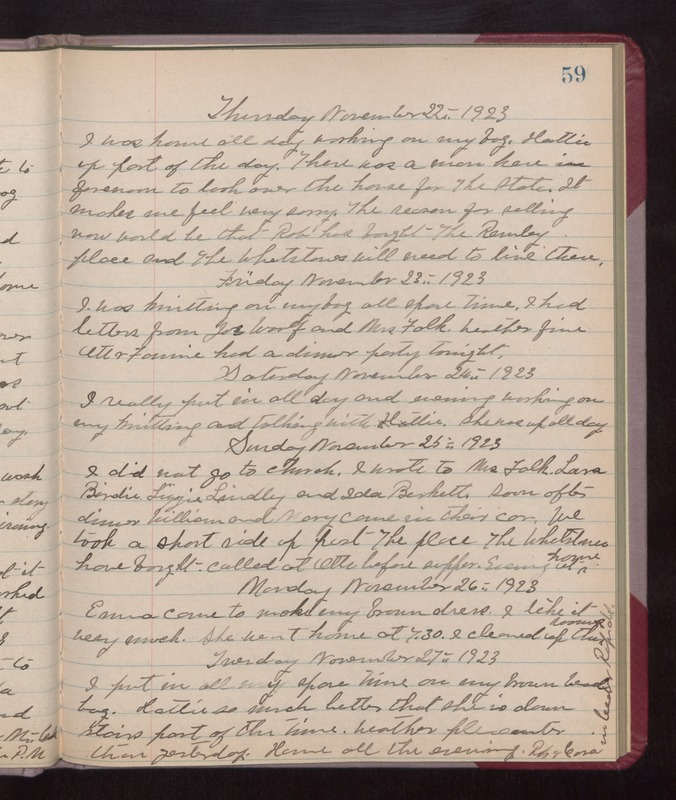 Thursday November 22nd 1923 I was home all day working on my bag. Hattie up part of the day. There was a man here in forenoon to look over the house for The State. It makes me feel very sorry. The reason for selling now would be that Rob had bought The Remley place and The Whetstones will need to live there. Friday November 23rd 1923 I was knitting on my bag all spare time. I had letters from Joe Woolf and Mrs Falk. Weather fine Ott & Fannie had a dinner party tonight. Saturday November 24th 1923 I really put in all day and evening working on my knitting and talking with Hattie. She was up all day. Sunday November 25th 1923 I did not go to church. I wrote to Mrs Falk, Laura, Birdie, Lizzie Lindley, and ida Burkett. Soon after dinner William and Mary came in their car. We took a short ride up past The Place The Whetstones have bought. Called at Otts before supper. Evening at home. Monday November 26th 1923 Emma came to make my brown dress. I like to very much. She went home at 7.30. I cleaned up the room. Tuesday November 27th 1923 I put in all my spare time on my brown bead bag. Hattie so much better that she is down stairs part of the time. Weather pleasanter that yesterday. Home all the evening. Rob & Cora in Cedar Rapids.